I will appreciate if you all could review the attached log for me. It appears to be okay to me apart from the occasional timing drop. That could be due to the high ambient temp in which I am seeing IAT >125F during the 3rd and 4th gear runs. In addition, oil temp is consistently above 250F. The car does feel a lot more powerful and smoother with this flash. It should be noted that I spent close to 2 hours on this road course (on & off) and I did not experience any misfire. 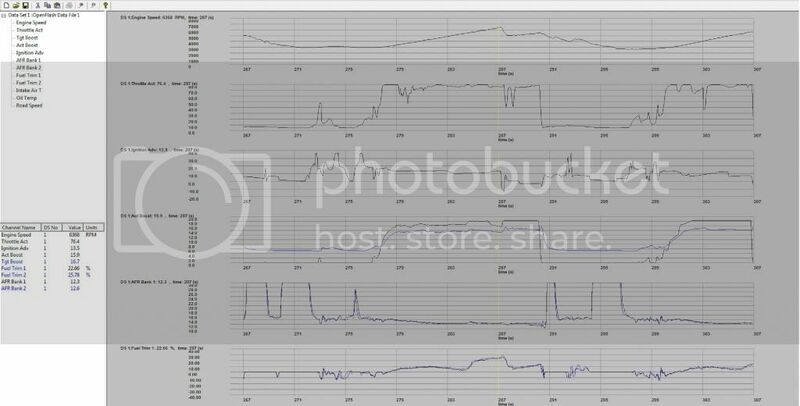 When I was on Procede stacked with PWM kit and backend fuel flash, I do get occasional misfire on high boost and aggressive timing. Complete log is attached as zip file. Is the e40 flash supposed to be used with rb turbos? You can use it, but I believe some items need to be tweaked before running it. Looks ok, flatline is harsh though!